Let’s continue what we left off from the previous article. Previously, we covered about the design process in SOLIDWORKS, synchronize features in SOLIDWORKS, and UI base on window preference, which allow user to easily pickup how to use SOLIDWORKS in no time. Assembly not only allow user to assemble the part, tons of features that can ease the design and assembly process for the user. Having trouble checking part interfere with other components? overlook the assembly design? SOLIDWORKS provide the interference analysis, allow you to check any component that collide each other. Speaking of modification, SOLIDWORKS allow us to directly edit the component in the assembly, while we can always update and cross check the interference issue. Interference detection function in SOLIDWORKS, able to check our models in assembly mode. Clearance verification function in SOLIDWORKS, able to check the gap or small spaces between two components. Tired being keep insert the same component in the same assembly? There’s always a shortcut to work thing around, one of the way, click and drag the component in assembly to multiply it. Click and drag function in SOLIDWORKS, save our time to duplicate same component instead of re-insert the same components. After you completed the assembly, you start to wonder, where can we get the total mass for our assembly. Using the mass properties in the evaluate section, within seconds can generate all the information we need, including volume, centre of mass, and total surface area in the assembly. Mass properties in SOLIDWORKS able to generate information that we need to analysis the model. Having any idea how to speed up the mate process? in latest SOLIDWORKS, in assembly mode, consist of magnetic mate. We can always pre-set the point in the part file, automatically let the component joined together in the assembly. Besides magnetic mate, smart features has been included in assembly all the time. Unfortunately, most of the user is not aware the beauty of smart features in SOLIDWORKS assembly. 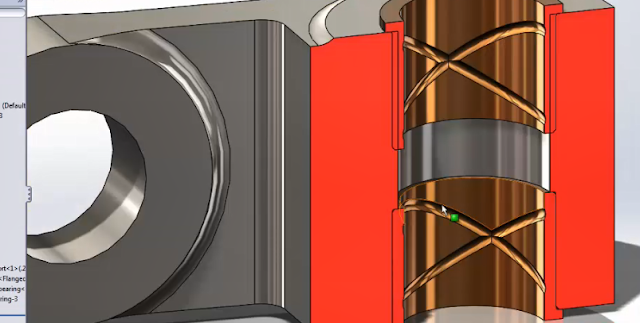 Magnetic mate introduce in SOLIDWORKS to save more time in mating the components. Smart features in assembly mode, usually will pop up a yellow star icon. Advantages of using the smart features in assembly mode. Drawing palette at the task bar is the best shortcut you ever need to generate 2d drawing for your models. Normally, we use model view from the layout, browse the files, and create standard top, right and front view for your model. Throughout this process, we are unable to preview the 2d drawing, to check whether we generate the correct view in drawing. By clicking, task panel, in the drawing palettes, refresh icon, allow you to get the latest model detail from part or assembly files. The small preview at the bottom, ease the user to choose and select the correct view for their drawing. View palette in task panel, preview of drawing before user drag into the drawing sheet. Tedious doing detail drawing, need to create another bigger view to show more detail from part/ assembly file. Detail view from the layout section, allow you to project partial of your drawing into a bigger drawing, using the scale option in the drawing, allow you to scale up the drawing base on your desire, meanwhile it won’t compromise the value or reading from the original drawing. Creating a detail view, with bigger view. Feeling lazy to point out the dimension of the model one by one? SOLIDWORKS offer a function known as model item, allow you to select which dimension detail, that you want to show in your drawing, example like, hole location, hole wizard properties, and including welding detail. Creating B.O.M table will not be the difficult task in SOLIDWORKS, using the table function, SOLIDWORKS can always list out quantity of the component, materials detail, part number, etc…. Model items in SOLIDWORKS, auto generate dimension. BOM table can be easily generated, showing the information of the model. That’s all the information I wanted to shout out to you all. SOLIDWORKS is a recommended tool for everyone to try out, as a first step to transform from 2d design style to 3d design style. With all these hidden features in SOLIDWORKS, the software always can help the user to ease their workflow with the minimum effort. Try out SOLIDWORKS today! Join our hands-on workshop today in IME PJ, Penang, JB, and Sarawak branch. Contact us for more information.